Situated on Harbor Island, one of San Diego’s most popular recreation locations, Sunroad Resort Marina consists of approximately 600 boat slips and a 10,000 square foot commercial building. One of the largest and most modern marinas in San Diego, this state of the art facility offers a concrete floating dock system, electric power, phones and cable TV to each slip, as well as abundant parking. 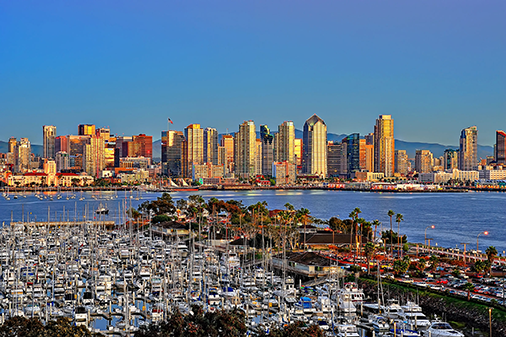 Sunroad won the development rights to develop the marina through a highly competitive RFP process of the Port of San Diego in 1984. Development was completed in 1986, and has since enjoyed the highest occupancy and slip rentals in San Diego. Sunroad Resort Marina is one of the largest tenants for the Port of San Diego, the largest minority owned business on tidelands, and continues to be a tenant in good standing.